♥.EVA - Made of quality material, non-toxic, odourless, tasteless, environmental protection and health. ♥.Use for myofascial release before exercise to prepare the body by loosening knots or trigger points in taut muscles. Regular foam rolling between workouts or during therapy also improves blood circulation and speeds up recovery time. Use your foam roller for back to speed up recovery. 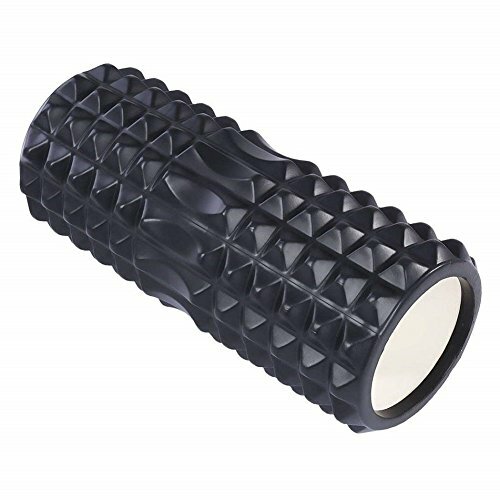 ♥.The exercise foam roller is ideal to warm up before exercise to reduce muscle injured by straining. Release back pain, muscle soreness or tension by rolling on the trigger points and knots yourself. ♥.13" x 5.7" Size is easy to store in gym bag or backpack and great for travel; Made of premium EVA materials and ABS hollow inner,makes it lightweight and durable enough and won't crack or break even under heavy pressure.